The first thing we should notice, is that even though Benedetti exist, Benedicaria is predominantly a woman’s practice. This is because the role and life of a Benedetta is not the awesome and glamorous thing that many New Age or Neopagan wannabe “magicians” would expect, but instead has much in common with the archetypes of homemaker, teacher, and mother, things that have traditionally and historically been associated as “a woman’s place” in virtually all cultures.73 We must realize, though, that even though such a life might seem as drudgery or mere chauvinism in the eyes of many Americans, there is a great deal of purpose in the things she does, and every action taken in the home is done with an awareness of the spiritual power behind it. In order to be proficient in her art, the Benedetta must be able to cook (and do it well), because there are a number of special dishes which she will have to occasionally prepare. The cooking is not just a physical act, however, but also a spiritual one, and for this reason she should never cook for anyone other than herself when she is angry or not well spiritually, lest she risk infecting or inadvertently cursing those who may eat the food. In addition to being a good cook, she must also be an excellent housekeeper, and must keep her house scrupulously clean. The old hermetic axiom tells us “As above, so below,” and the Epistle to the Hebrews tells us of the relationship between the copies of heavenly things and the heavenly things themselves.74 Just as neglecting a house can cause it to become filthy, scattered with dust, dirty dishes, pet dander, and even cockroaches, so it is also true that when we neglect our spirit, we also allow it to attract spiritual dirt, dust, and bugs. Ditto for the “spiritual area” in and around the house. Therefore we can see that by keeping her house physically clean, she is also keeping it spiritually clean, and by extension helping herself to remain spiritually clean as well. The Benedetta is also a mother and a teacher not only to her own children, but also to those of the community. As a mother, it is she who wears the black mourning clothes (il lutto) for a year after someone dies, and sometimes indefinitely, so that others of the family may wear the mourning-garb for just forty days; in this sense she shows the strength of a Mother who supports the burdens of her children. As a mother, she also has the duty and the obligation to reach out to grieving families, and also to reach out to families who have just had a baby. As a teacher, it is her duty to educate the people against superstition and superstitious thinking. So as we can see here, in the Benedetta we are not looking at the weak and passive-aggressive stereotype of a “housewife” so derided in the modern Western world (which looks at motherhood as a thing to be scorned and as “holding back” a woman from a meaningful career! ), but instead we are faced with a woman whose existence is full of purpose, and whose actions are replete with meaning and spiritual power. Though a mother and a teacher, it is as a healer where the Benedetta truly comes into her own. Her treatments were the life and death of the people, especially since to the contadini, they were often the only treatments available. The contadini had no access to a physician, and the priest was forbidden from practicing medicine75, and so the Benedetta was their “go-to gal” for treatment and recovery. In the Benedetta’s world-view, the illnesses that she treats can be broken down into three categories: the Fear (lu Scantu), the Worms (i Vermi), and the Evil Eye (il Malocchio). The Fear and the Worms are connected and involve forces inside the victim, while the Evil Eye refers to a psychic or spiritual attack. The Fear is thus something which can be self-induced, or can come from an accident or even a curse. Any type of psychic trauma or psychic attack can be classified under lu Scantu if it meets the symptoms given above, and it is then treated accordingly. The general thought is that we all have worms in an unspecified sac beneath our stomachs. As a consequence of the Fear, the worms are let loose from the sac and inside our stomachs, from whence they climb and make their way to our throat. Once they get to the throat, it is possible for the victim to die by way of suffocation.78 It is also said that “The malady of the Worms is, according to popular belief, a frequent affliction in the first infancy and above all strikes blonde babies, goodness knows why.”79 Treatments of worms can involve zucchini seeds80, chamomile compresses and/or herbal teas, and the famous “Christmas Eve prayer,” which is considered to be a secret prayer which can be taught only on midnight at Christmas Eve.81 This prayer also has adaptations for use against the Malocchio, and we will encounter this prayer again at a later point in this chapter. Of the three illnesses, the Malocchio is probably the most famous, and according to Quattrocchi, breaking the Malocchio is the primary job of the Benedicaria practitioner, and describes it as “an affliction known to almost all peoples” which is “believed to be responsible for much human misery and suffering. Many people still believe in it and its effect on their lives.”82 Quattrocchi and his wife, Peggy, once described the Malocchio to me as “a curse you put on someone without realizing it, because of hatred or envy.”83 Although Quattrocchi has occasionally come under fire from other Benedetti for some of his claims,84 his description of the Malocchio is consistent with other practitioners’ descriptions. Yet in essence, this is the realm and world-view in which the Benedetta operates. She uses physical actions, herbs, and prayers, in order to heal the physical and the spiritual. She also endeavors to keep herself right with God by way of prayer, Confession, and Communion, because she knows that a sick mother is of no use to her children, and so if she is not right spiritually, then she is of no help to anybody else. She must strive to keep herself spiritually clean and her life in order, even with the burdens that accompany seeing and treating those who come to her (a conundrum with which any priest can identify!). Though she is a devout Catholic and almost never makes waves with the established priesthood, she herself could in fact be considered a member of a “shadow priesthood,” ministering to the people in ways that the priest cannot, working underground and outside the official hierarchy, hearing confessions and solving problems which the people are afraid to mention to their priests. This is the world of the Benedetta, the world of the homemaker, the mother, the teacher, the healer, and the priestess. This is her world-view, over, above, below, and thoroughly enmeshed within the world-view of Traditional Catholicism85, and the context in which everything in this book, and especially in this present chapter, must be understood. 73. 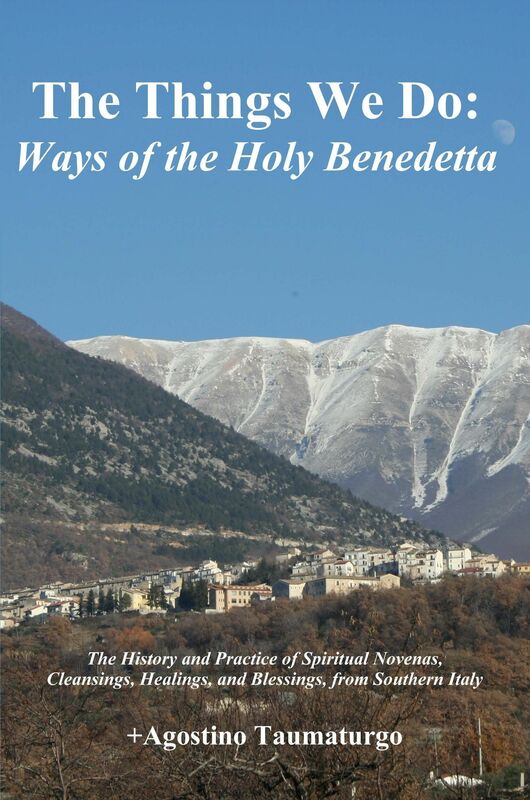 As we will remember from our “Speculative History,” the roots of Benedicaria are rooted in the ancient domestic cult, and thus it would be proper that the Benedetta’s life would be one devoted to home, family, and community. 74. “It is necessary therefore that the patterns of heavenly things should be cleansed with these: but the heavenly things themselves with better sacrifices than these. For Jesus is not entered into the Holies made with hands, the patterns of the true: but into Heaven itself, that he may appear now in the presence of God for us.” Hebrews 9:23-24 (DRV). The “pattern” of the heavenly thing was its physical copy or representation here on earth, while the heavenly thing itself stands in a superior spiritual relationship thereto. 75. In 1215, The Fourth Lateran Council, Canon 18, forbade clerics in Major Orders from practicing surgery. 76. Ventura, Veronica. Terapie: Forme e Termini Della Medicina Popolare a Gela: la Malattia Come Evento Sociale. Found online at http://www.gelacittadimare.it/terapie.html. The translation given is my own. 80. Roselli and Songofthesea. Unfortunately, I did not get a detailed description of the use of zucchini seeds for this purpose. 83. Phone conversation, October 2002. 84. The main claim for which Quattrocchi has come under fire is the claim that Benedicaria is not witchcraft in any way, shape, or form. This claim is very true in theory, but in practice Benedicaria and Stregoneria are often mixed without the Benedetta’s conscious knowledge. 85. Magliocco, Sabina, Stregheria and Vernacular Magic in Italy: A Comparison. “Italian vernacular magic… is neither a religion nor a formalized system of practice. It is both a worldview and a set of customs tied to the agro-pastoral cycle which is strongly embedded in the lives of its practitioners, almost never on a self-conscious level. For most of its carriers, it is simply an ordinary way of doing things and behaving. While it may have historical roots in pre-Christian practices, it is emphatically not a pagan tradition, but firmly embedded within a Roman Catholic cultural matrix.” Though her article’s main purpose is to lend an air of legitimacy to the “Stregheria movement” (which she does by capitalizing on the assimilationism I’ve mentioned in previous chapters), her descriptions of Stregoneria and Benedicaria — which she collectively refers to as “Italian vernacular magic” – are correct and accurate. 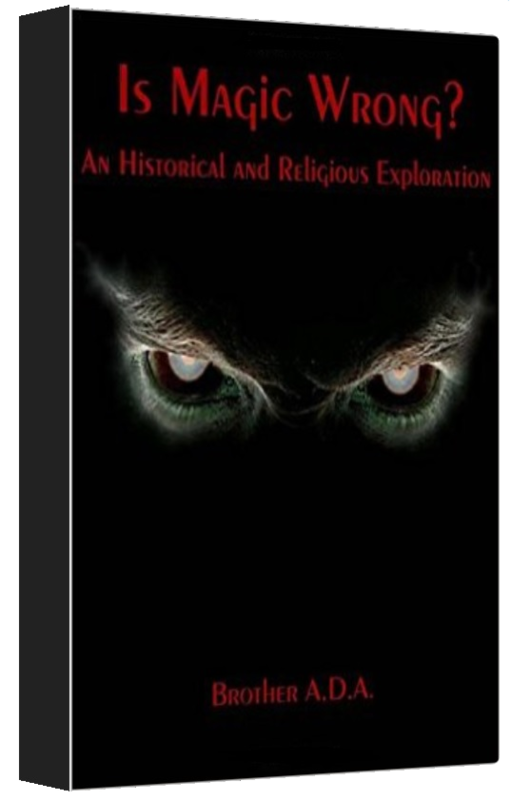 This entry was posted in Uncategorized and tagged benedicaria, book, christian, god, jesus, magic, magick, occult, prayer, spirituality. Bookmark the permalink.